Hamburg endured another day of misery in Munich, while Dortmund completed an even dozen of wins against Freiburg and there were important wins for Leipzig, Hertha Berlin and Mainz on Matchday 22. How did your Official Fantasy Bundesliga team fare on Matchday 22? Check your progress here! Robert Lewandowski grabbed the headlines with a hat-trick at the Allianz Arena, taking him to an impressive 19 for the season and in a share of top spot in the latest scoring charts. 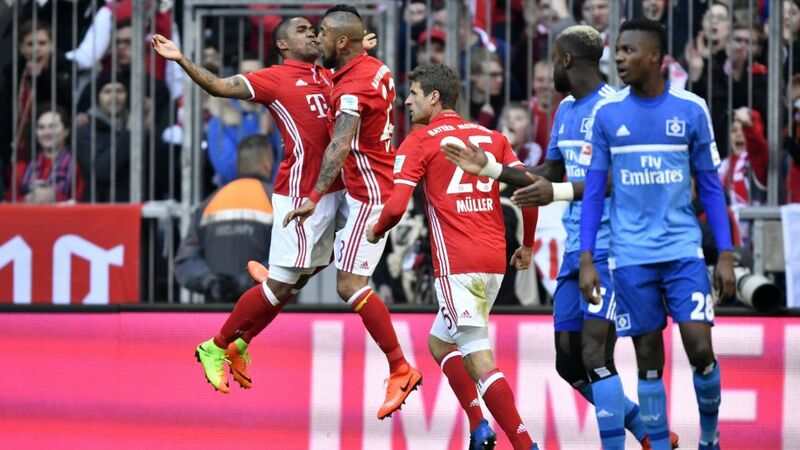 Arturo Vidal, David Alaba and Arjen Robben were also on target in a masterful display, while substitute Kingsley Coman netted a cool brace to complete the scoring in what was Carlo Ancelotti's 1,000th competitive match as a head coach. It was also the latest in a long list of chastening defeats for HSV on this ground: they were beaten by the same 8-0 scoreline in February 2015 and lost 9-2 here in 2013. Borussia Dortmund racked up a dozen of consecutive wins over Freiburg with the livewire Ousmane Dembele sparking them into action early on in head coach Thomas Tuchel's 100th Bundesliga match. BVB controlled proceedings throughout and Pierre-Emerick Aubameyang ended a run of two games without a goal by netting a second-half brace, moving him level with Lewandowski at the top of the goalscoring charts. RB Leipzig recorded a ninth home win of the season to keep the Saxons hot on the heels of league leaders Bayern Munich. The Red Bulls dominated the first half, opening the scoring as early as the fifth minute when Emil Forsberg struck. Dominic Maroh turned into his own net before the interval to double Leipzig’s lead and while Cologne rallied and found a lifeline through Yuya Osako, the irrepressible Timo Werner rubber-stamped Leipzig's win. Hoffenheim remain in the top four after securing a point in a hard-earned draw away to Schalke. Alessandro Schöpf broke the deadlock for the hosts in the fifth minute, but Julian Nagelsmann's resilient Hoffenheim side were rewarded for their patience in the closing stages when Sebastian Rudy equalised. After the disappointment of conceding a 96th-minute equaliser against Bayern last week, Hertha got back to winning ways with a typically gritty win against Frankfurt. The hosts went in front just after the interval when Vedad Ibisevic netted for the second week in a row, with Eintracht's challenge suffering a further setback when Haris Seferovic was sent off. Vladimir Darida made sure of the points with a late header. Eagles skipper Makoto Hasebe made his 234th Bundesliga appearance at the Olympiastadion, matching Yasuhiko Okudera's record for a Japanese player in Germany's top flight. Lars Stindl struck again as Gladbach continued their recent resurgence under Dieter Hecking. Stindl continued his own hot streak – with seven goals in his last seven games – to put the Foals on their way to all three points against an Ingolstadt side who again belied their place inside the bottom three. Andre Hahn then put the result beyond doubt in stoppage time as Gladbach edged up to within six points of the top six. Mainz caught Bayer Leverkusen napping early on to decide this game with two goals inside the opening quarter of an hour. Stefan Bell broke the deadlock within three minutes, before Levin Öztunali’s free-kick doubled their advantage. Leverkusen could not muster a reply as Mainz dug in to seal a morale-boosting victory. Germany international Serge Gnabry's quick-fire brace helped Bremen to their second successive win of 2017. Borja Mayoral pulled a goal back for Wolfsburg in the 19th minute, but despite laying siege to the Werder goal in the second half they were unable to salvage a share of the spoils. Click here for the latest Bundesliga standings!